NORTH POLE – What should’ve been a jolly Christmas Eve filled with joy and good tidings took a turn for the worst when Santa reportedly became enraged to discover that the popular Hardywood brewery had run out of its famous Gingerbread Stout. The Hardywood Gingerbread Stout, a seasonal stout that is produced around the holidays, has become very popular around the Richmond area. As a result, it’s not uncommon to find Hardywood’s shelves completely depleted of its Christmas cheer. Santa, in an angered temperament, continued his deliveries as scheduled. Before he took off, he was seen mouthing profanities, and possibly smashed one small boxed gift on the concrete in a fit of rage. 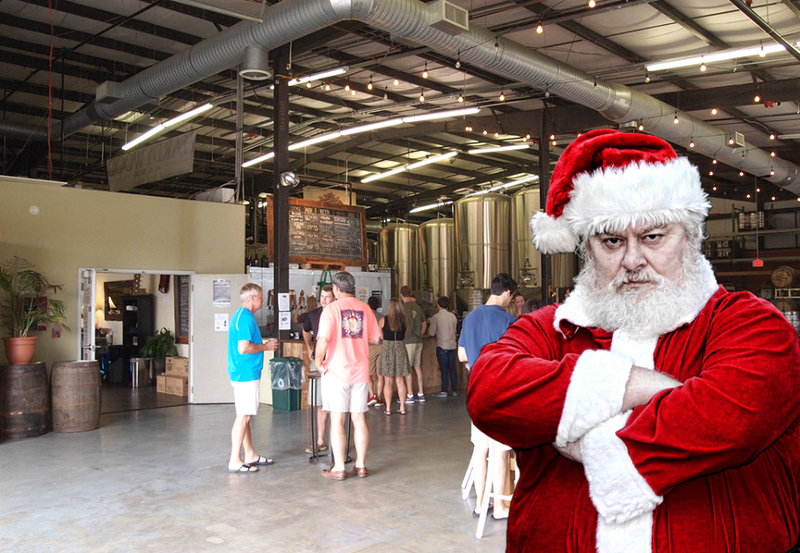 The brewery has yet to issue an official statement on the incident, but a representative who was onsite last night did mention that Santa “seemed slightly inebriated and was acting somewhat belligerent. He likely had a few drinks before showing up here.” There were also concerns amongst his overall condition. “He really shouldn’t have been operating a reindeer-led sleigh at that point,” the rep commented.